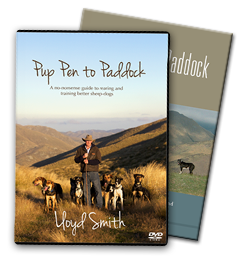 A no-nonsense DVD guide to rearing and training better sheep-dogs. This DVD is a follow-on from his successful training book which describes and demonstrates a system of training sheep dogs that is easy to follow and simple to apply for both heading dogs & huntaways. This comprehensive guide takes the viewer through every step from pup to becoming a competent member of the working team. A 'must have' for any dog trainer who wants to experience the satisfaction of training their own dogs. Click here to read Dr Clive Dalton's DVD review. A no-nonsense guide to rearing and training better sheep-dogs. 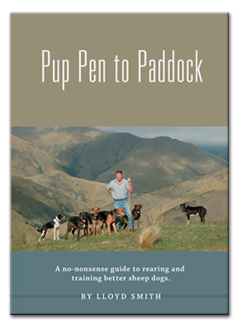 From Pup Pen To Paddock (the book) describes an easy to follow and apply system of training sheep dogs for, first and foremost, every day farm work. Lloyd’s system is both effective and highly regarded and he regularly demonstrates this at field days and shows. This book is a permanent reminder of those practical tutorials. Equally, for both huntaways and heading dogs these pages are a stand-alone and easily understood reference, logically following every step from the pup pen through to membership of the working team. 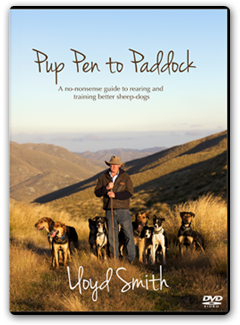 This book is a must for any stockman or woman who wants to gain the satisfaction of training their own sheep dogs along with the pleasure of developing a reliable working team.